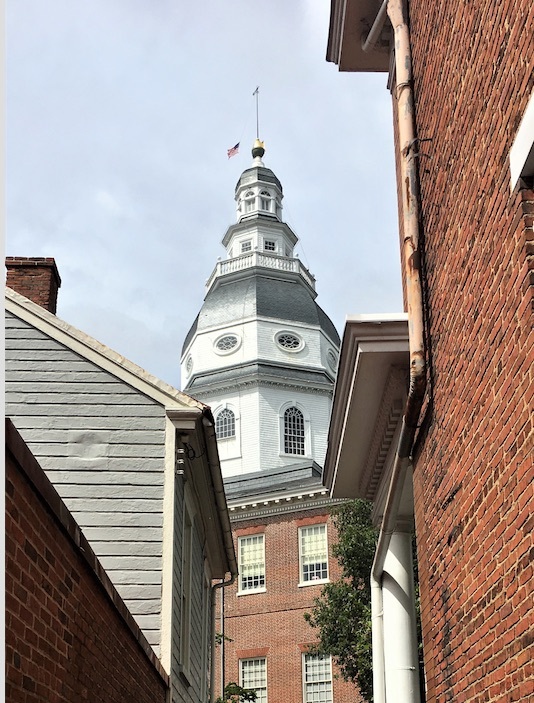 Nestled in the heart of the Chesapeake Bay at the mouth of the Severn River, Annapolis is defined by the water surrounding it, and the history it shaped. 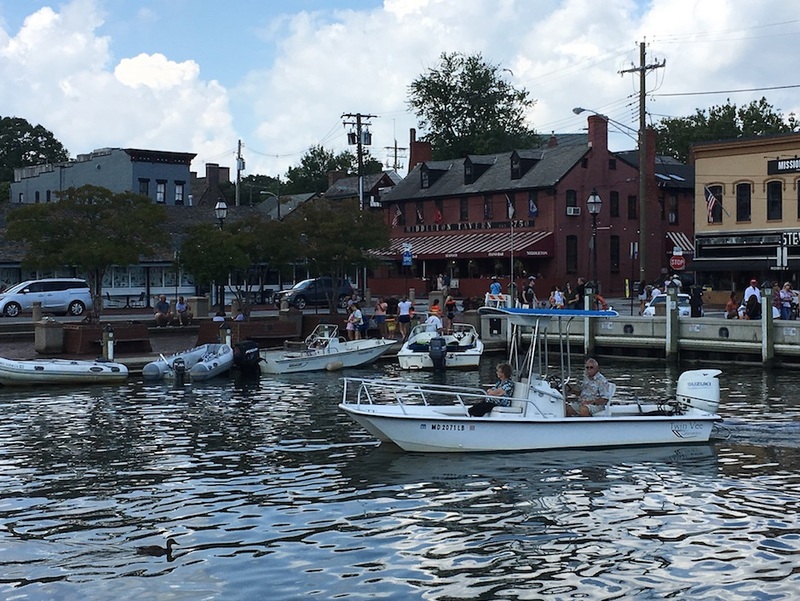 Grab an ice cream cone and join the parade of boats and people strutting through Ego Alley, the Annapolis Harbor area. Experience the water first hand by booking a cruise, water tour, or even fishing charter. Hop on a water taxi and skim across the harbor to Eastport, or explore Spa Creek and Back Creek at your leisure. If you are more ambitious, you can rent a kayak or paddle board, and get acquainted with the water close up! Or, watch the scene while enjoying traditional Bay crabs or oysters from local eateries lining the harbor. My favorite is Pusser’s Caribbean Grille, which has an unsurpassed view of the historic State House and Ego Alley procession! 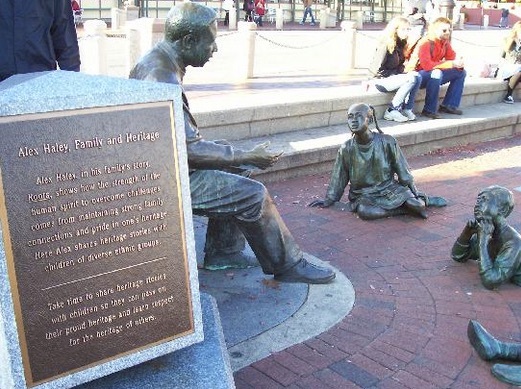 Before leaving City Dock, check out the Kunta Kinte Memorial, recognizing author Alex Haley who traced his roots back to his ancestor’s arrival at the Port of Annapolis as a slave, and famously told his family’s story in his book and TV series, Roots. Annapolis, originally settled by the Puritans in 1649, was renamed to honor Princess Anne, heir to the throne, when the Maryland capital was moved to Annapolis in 1694. The city was designed in a baroque style with two circles, one for the state house and one for the church, with radiating streets. stroll down the brick-paved streets. Don’t miss the William Paca House and Gardens. Built in the 1760s by William Paca, one of Maryland’s four Signers of the Declaration of Independence and the state’s third Governor, the house and gardens are a recognized National Historic Landmark. Perched atop Main Street, St. Anne’s Episcopal Church is the city’s spiritual anchor. Constructed in 1858-59, the Church’s current building, its third, incorporated part of the former building’s tower in its structure. It is designed in a Romanesque Revival style. Two of the stained glass windows are from the renowned Tiffany Studio. The adjoining historic cemetery, with the oldest grave stone dating back to 1767, is a place of peace and repose. St. Anne’s Church is known for its pipe organs and fine acoustics, and offers a free concert series Thursday evenings in the spring and fall. Also not to be missed is the State of Maryland’s official museum of African American heritage, the Banneker-Douglass Museum. There you will find exhibitions of African American history and culture. 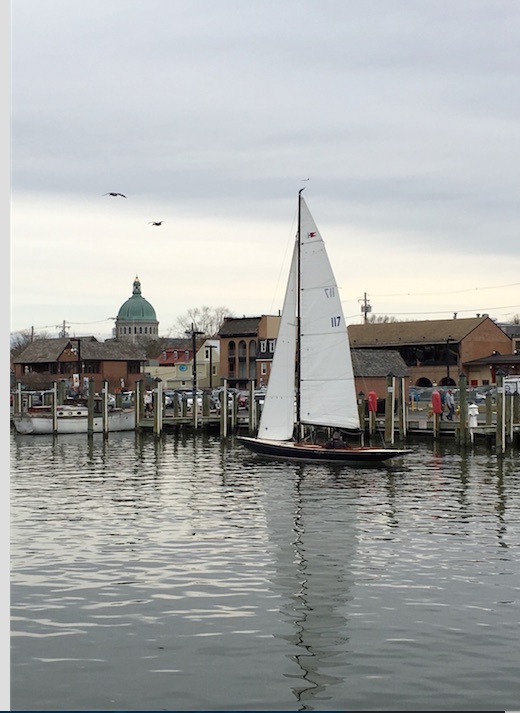 For many, Annapolis is synonymous with the United States Naval Academy, the training ground for officers of the U.S. Navy and the Marine Corps since 1845. The Academy’s expansive waterfront campus features Beaux Arts architecture, monuments to naval icons, athletic fields, and a naval history museum. The main chapel’s high dome is a visible landmark throughout Annapolis. John Paul Jones’ crypt lies beneath the chapel. The museum boasts artifacts of American naval history and the famous Rogers Collection of antique ship models. centered on the study and discussion of Great Books. The college’s Mitchell Gallery offers museum-quality exhibitions and insightful lectures and discussions to the public. 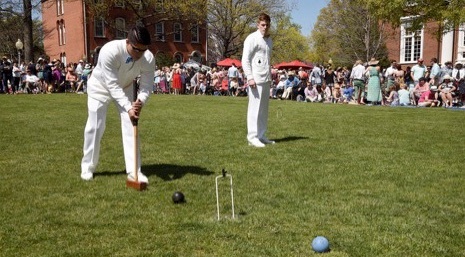 Each spring, the Johnnies and Middies challenge each other to an animated game of croquet on the front lawn of St. John’s campus. This festive event has become an Annapolis tradition. For an unforgettable shopping experience, meander around State Circle and down Maryland Avenue and discover boutique shops of every variety—featuring antiques, interior design, vintage clothing, old and rare books, knitting, and vinyl records. Take a break at one of the independently owned coffee shops or pubs. And don’t overlook the Hammond-Harwood and Chase Lloyd Houses, premier examples of colonial architecture. And, finally, don’t leave out Eastport, the maritime district of Annapolis, located just across the bridge over Spa Creek from the City Dock area. Eastport was settled in 1665 and remained mostly farmland until the 1800s. Home to fishermen, crabbers, watermen, boat builders, sail makers, marine engineers, and other maritime workers, Eastport was annexed to the city in 1951. Enjoy the best views of Annapolis’ iconic domes and spires from its scenic waterfront. Eastport boasts an array of waterfront fresh seafood restaurants and renowned steakhouses. My favorite, the Boatyard Bar & Grill, is a lively, family-friendly, nautical-themed pub where you can get award winning crab cakes, seafood specialties, or burgers; the perfect spot for lunch or to relax at the end of a busy day touring charming, historic Annapolis! If a day trip to Annapolis, Maryland isn’t in the cards for you and you want a place to stay, this search box will take you right to hotels in the area. Janet LaBella is a freelance writer who enjoys exploring a multitude of natural, historical and cultural environments in the U.S. and abroad. For many years she worked as a public interest attorney, and is embarking on a writing/editing career. In addition, Janet provides consulting services on management issues.